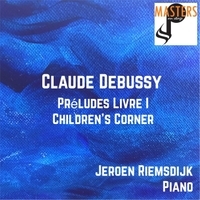 Debussy wrote his first album of 12 Préludes in a matter of months, December 1909 and February 1910, at an unusually fast pace for Debussy. The titles of the preludes are highly significant, both in terms of their descriptive quality, and in the way they were placed in the written score. The titles are written at the end of each work, allowing the performer to experience each individual sound world with fresh ears, without being influenced by Debussy's titles beforehand. At least one of the titles is poetically vague: the exact meaning of Voiles, the title of the second prelude of the first book, is impossible to determine for certain, since plural nouns do not distinguish genders, as the singular forms may do (in French, Voiles can mean either "veils" or "sails"). Jeroen Riemsdijk is a Dutch Concert Pianist, Chamber musician, Teacher and Author. He performs regularly as soloist and with distinguished artists in Concerts Halls, on Festivals and in the recording studio. Jeroen Riemsdijk is artistic leader of ‘Masters on Stage’ and has commissioned and premiered many new works. Notable recent productions were the integral Cello Sonatas by Beethoven and in one day all piano quartets and piano quintet of Brahms with members of Claudio Abbado’s Mozart Orchestra. Currently he is working on the ‘Estonian Evocations’ project, introducing exotic Piano Works from Estonia. Jeroen Riemsdijk is author of ‘The Golden Fingers Technique for Pianists. The art of Passagework’ which is sold worldwide and has published several articles about sight reading, balanced piano technique and the Style Brilliant period. His discography contains music among others by Shostakovich, Debussy, Liszt, Kalkbrenner, Sisask, and Dutch Composers Wim Zwaag(4 CD’s) and Robert Quodbach. His most recent recordings contain all 10 Piano Sonatas, and several cycles by Estonian composer Jaan Rääts(6 CD’s). Riemsdijk teaches piano solo and accompaniment at the Conservatoire of Maastricht. Jeroen Riemsdijk received his ‘Konzertdiplom’ in Essen. He completed his initial studies ‘with distinction’ in the Class of Prof. Ben Smits (a pupil of Cornelius Berkhout and Clara Haskil). He was a prizewinner of several competitions, and was soloist at Sir Yehudi Menuhin’s Young Musicians Foundation.